Formally established in 1968, the Northern Illinois Street Rod Association (NILSRA) celebrated the 50th Anniversary of the Club in 2018. NILSRA promotes various types of automotive enthusiast activities, creates good fellowship and sportsmanship amongst its members, and acts to inform the public about our love of vintage performance automobiles. Club get togethers and business meetings are held the first Monday of every month at 7:00 pm at Nick's Pizza & Pub 990 South Randall Road Elgin; IL, just 5.6 miles south of the I-90 Tollway on Randall Road. If you have an interest in joining the Club, please feel welcome to join us at our monthly meetings or any of our planned activities and events! NILSRA members are also known for their community involvement by donating their time and moneys for other worthwhile charitable causes. The Club has made many contributions to charitable and educational organizations which are supported by the proceeds of the Fiesta Days Car Show. In 2017, we donated $1,000 to the World Motor Sports Breast Cancer Foundation and $500 to the South Elgin High School automotive shop program to help the students attend various engine building competition events here in the Chicago area and across the Country. In 2018, we donated $1,000 to the McHenry Police Officer's Charitable Association which is also known as MOPAC. 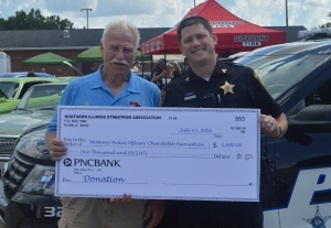 The Association is a charitable organization comprised of sworn members of the McHenry Police Department. The only method of funding are donations and an annual golf outing that the Association runs with the McHenry Firefighter's Association (MFA). The organization provides three local scholarships for high school students to assist with college costs. And also donates to local causes, especially Police related ones.